March 20 is International Day of Happiness; an initiative developed by the United Nations that focuses on the important role happiness plays in the lives of people around the world. This year’s theme is ‘Happier Together’ and there’s no better place to start spreading happiness than in your work environment. Often, it’s the simplest and easiest things that can bring a smile. In light of the event, Nicole Gorton, Director of Robert Half Australia has penned four top tips that will help bring more happiness to your surrounds – starting with your work environment. 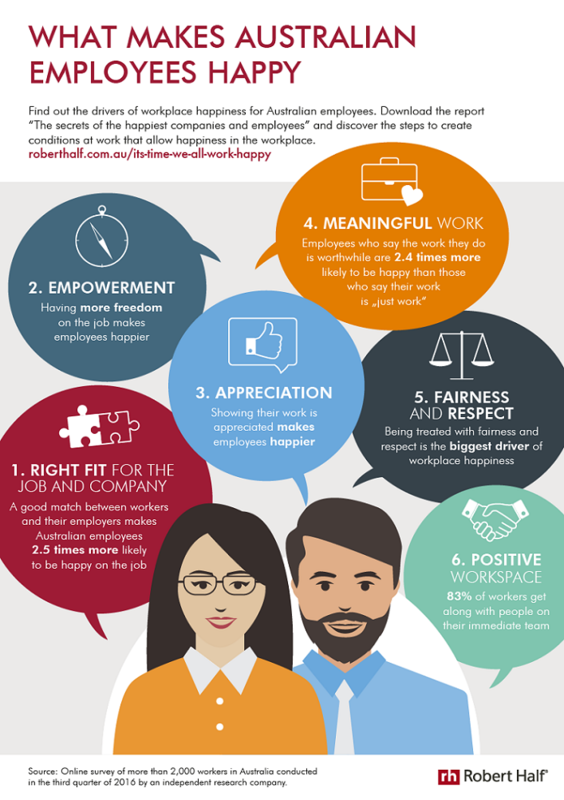 According to Robert Half’s The Secrets of the Happiest Companies and Employees, happy employees are the most vocal and persuasive advocates for their organisations. Beyond the spread of optimism and goodwill, workplace happiness matters because it can translate into a positive image for a company (both internally and externally), bolstering corporate reputation and recruitment efforts. Clearly, happiness offers a win-win for everyone in a work environment. 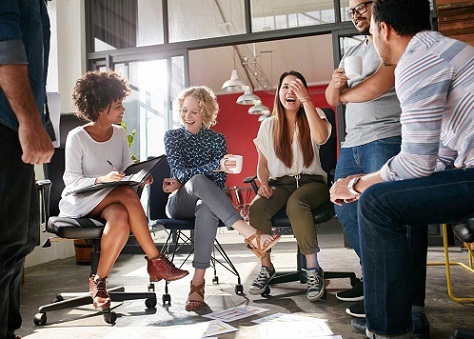 So, mark the International Day of Happiness on the work calendar with five simple ways to bring more positivity to the workplace. A research paper published in the Journal of Experimental Psychology noted that connecting with others, even strangers, increases personal happiness. With this in mind, a great way to set the tone for International Day of Happiness is by greeting colleagues with a cheery “hello”. Go beyond the normal circle and offer a hearty “good morning” to the front desk staff, or the executive sharing a lift ride, to extend the feel-good factor across the organisation. Taking a few minutes to offer glowing feedback doesn’t just boost happiness, it can also have a positive impact on productivity. The same US research found 40% of workers would put more energy into their work if their contribution was recognised more frequently. Here in Australia, a Gallop Poll found 76% of workers are not engaged in their job. Chances are, a simple “thank you for doing a great job” could go a long way to elevating happiness, fulfilment and enthusiasm among employees. Random acts of kindness offer a two-for-one benefit. According to the Harvard Business School, a person extending a hand of kindness feels happier, while the recipient feels an uptick in joy too. Share the goodwill on International Day of Happiness with unexpected gestures of kindness. Pick up a surprise coffee for a colleague on the way to work, help a co-worker complete a project on time, or lend a hand to fix a paper jam instead of turning a blind eye to the struggles going on in the photocopy area. Giving has a way of making people feel good. Harvard University confirmed this with research showing that donating to charity has a direct link to personal happiness. This makes it worth celebrating International Day of Happiness by combining efforts into corporate social responsibility. Instead of simply passing around a bucket for a coin drop, aim to make it an inclusive, fun-filled event. Try selling cakes home-baked by the accounts team accompanied by tea or coffee prepared by the IT crew, to let everyone feel part of the action. One of the big pluses of happiness, is that like laughter, it can be contagious. Don’t be surprised if any “happy” initiatives introduced will extend beyond the 24 hours of International Day of Happiness. As a corporate happiness ambassador, an organisation can have a direct and lasting impact on the satisfaction, meaning and joy that the entire staff gain from their work environment.